Cavities are generally the most common cause of a toothache. However, there are different types of tooth pain, and other dental problems like tooth sensitivity, a cracked or chipped tooth, or an infection may also be at the root of persistent pain or throbbing in a tooth. Because a thorough dental exam is usually necessary to determine what is causing a toothache, the dentists at Layton, UT-based 4Dentalhealth advise patients to schedule an appointment for persistent tooth pain in order to get the appropriate treatment and to avoid potentially serious complications in the future. In general, pain is considered a dental emergency, and should be examined by a dentist as soon as possible. If a tooth is chipped or broken as the result of an accident, bacteria can accumulate in the space that holds the nerves, blood vessels, and pulp inside the tooth, which can lead to painful infections and potential permanent damage and even tooth loss. An emergency root canal may be necessary, depending on the damage, in order to save the tooth. Another common cause of tooth pain is sensitivity, which is sometimes a symptom of a cavity. Sensitivity causes numbing and sharp pain when the teeth come into contact with hot or cold food and beverages. In addition to cavities, gum recession and wearing down of the enamel can cause sensitivity. A dental exam can help to determine the cause of tooth sensitivity. In some cases, pain can be a sign of a broken or cracked crown or dental filling that needs to be replaced. Conditions like temporomandibular disorder (TMD) and sinusitis cause pain that can be mistaken for pain in a tooth or the jaw. If you are suffering from a persistent toothache, contact 4Dentalhealth by calling (801) 889-1044 to schedule an appointment with a dentist today. Tooth decay is the process that results in a cavity (dental caries), and occurs when bacteria in your mouth make acids that eat away at a tooth. If tooth decay is not treated, it can cause pain, infection and potential tooth loss. No one wants to lose a tooth, or even experience a cavity. Luckily, tooth decay is easily preventable by brushing and flossing your teeth regularly, visiting 4 Dental Health and Dr. Steven Christensen for teeth cleaning and checkups, and avoiding foods that are high in sugar. The combination of bacteria and food causes tooth decay. When food is not properly removed from your teeth a clear, sticky substance called plaque that contains bacteria is always forming on your teeth and gums. As the bacteria feed on the sugars in the food that you eat, they make acids, which attack the teeth for 20 minutes or more after eating. Over a period of time, these acids destroy tooth enamel, resulting in tooth decay. Young children can develop baby bottle tooth decay, or early childhood caries, which destroys enamel quickly. This type of decay is common in children who are put to sleep with a bottle of milk or juice. The bottle exposes the teeth constantly to carbohydrates through the night. Bacteria then rapidly grow, producing acid that decay teeth. If a parent does not clean the child’s teeth properly, decay can worsen. In older adults, the exposed roots of teeth can develop cavities. Older adults are more likely to have receding gums caused by years of hard brushing or periodontal disease. 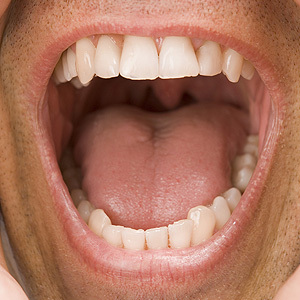 Additionally, older adults are also more prone to have dry mouth, which provides less protection of the teeth due to a decrease in saliva production. Decay can form beneath fillings, or other tooth repairs, such as crowns. Sometimes bacteria and bits of food can slip between the tooth and a poorly placed filling or crown. This also can happen if the filling cracks or pulls away from the tooth, leaving a gap. Schedule an appointment with Dr. Steven Christensen, our dentist serving Layton, at 4 Dental Health today for further examination of your teeth. With regular cleanings and examinations, you can help prevent tooth decay with the help of your dentist.